Range is the last range before you reach the Cape Tribulation area. You can capture great views of the Cape Tribulation headland and fringing reefs as you descend from the Noah Range into the Cape Trib valley. Cape Tribulation has become an icon to many people, as it is the only place known on Earth where two World Heritage areas exist side by side, fondly referred to as 'where the rainforest meets the reef'. Cape Tribulation extends north along the Bloomfield Track as far as Bloomfield River. Access is suitable for 4WD only. Cape Tribulation was named by British explorer, Captain James Cook, after his ship the Endeavour ran aground, on what is now named Endeavour Reef. He then named the point he had chartered earlier in the day "Cape Tribulation", as this is where all his trials and tribulations began. The mountain behind he named "Mount Sorrow", and a bay to the north where they rested while towing the ship up the coast with row boats was named "Weary Bay". The Mason family was part of the first group of Europeans to settle Cape Tribulation in 1931 and progressively tried to earn a living from fruit and vegetables, timber cutting and cattle. 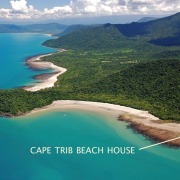 Cape Tribulation really became famous when in 1982 the Douglas Shire Council began bulldozing a track through the coastal lowland rainforest from Cape Tribulation north to the Bloomfield River. The controversial Bloomfield Track attracted protesters from everywhere; the uproar was a deciding factor in having the Daintree National Park internationally recognised as a significant natural area. In 1988 UNESCO declared Cape Tribulation National Park a World Heritage Area because of its outstanding value and beauty, once again local and state government protested to no avail. Heritage Area. The land is owned by The Mason Family and is accessible by guided tours only. These real rainforest tracks resemble an Aboriginal Road that would have existed here before the arrival of Europeans. 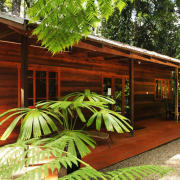 Cape Tribulation itself contains a small number of eco lodges, rainforest retreats and backpacker hostels. romantic couples retreats. Onsite facilities include a cafe, bistro & bar, plus self catering facilities and activities such as Internet Café, pool table, family games and a large salt water swimming pool with decking for sunbaking. 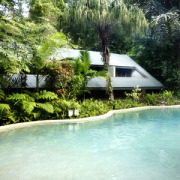 Cape Trib Beach House is the perfect base for exploring the fringing reefs, where the rainforest meets the reef. 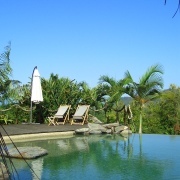 The Cape Trib Sanctuary is a luxury executive four bedroom tropical house designed by award winning architect Chris Van Dyke. It has exceptional views from every room in the house and offers total privacy and seclusion. 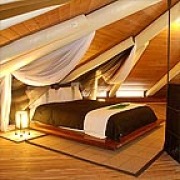 This property is for the discerning traveler who seeks comfort, simplicity and above all privacy. Situated only 3 minutes from the local café, shops and restaurants in the Cape Tribulation Village, and a short 2 minute walk to your own tropical white sand beach. 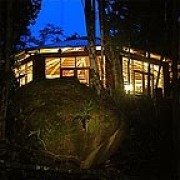 The Sanctuary has private hiking trails, swimming holes and secluded mountain streams flowing through the property. From Cairns and Port Douglas take the Captain Cook Hwy heading north. 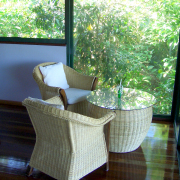 Stop in at Mossman for some last minute supplies before reaching the Daintree River crossing. After crossing the Daintree River Ferry, journey through some of the world's oldest surviving rainforest, crossing fresh water creeks and journeying along a myrid of landscapes through to Cape Tribulation. 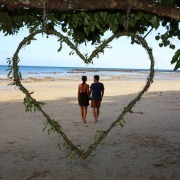 How long should we stay at Cape Tribulation? If you are in a hurry then at least one night will allow you to make the most of exploring the region. 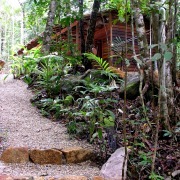 Three nights will give you an adequate rainforest experience. If you would like to fill your days with action-packed adventures, then you can probably find enough activity to warrent a five night stay. If you are looking for a destination where you can switch off, reconnect with nature and completely relax then seven nights is a must. 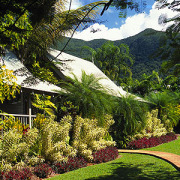 There are plenty of activities in Cape Tribulation to provide you with a wide and varied rainforest experience. They all offer an appreciation to our land, and allow you discover further the marvels of this region. Explore where the rainforest meets the reef from another perspective. A kayaking trip will allow you to view the sheer magnificence of the rainforest clad mountains, as they descend onto the shore and meet with the fringing reef. Your experienced local guide will lead you around the magnificent Cape Trib headland, whilst looking out for marine wildlife along the way. Sea Kaying is a fantastic eco trip which allows you to explore tropical beaches, fringing reef, mangroves and marine wildlife in a relaxed and special environment. Jungle Surfing is a unique eco-adventure where your feet don’t touch the ground! Fly through the trees on flying fox ziplines, stopping at five tree platforms taking in spectacular bird’s eye views over the treetops. A guide will greet you, connect you safely to the tree, and introduce you to different elements of the forest before sending you on your way to the next platform. This fun, educational, all weather experience is suitable for all ages from 3 to 103. This is certainly a unique way to see the rainforest up close. Visitors to Cape Tribulation will be amazed after having met one of the more fascinating inhabitants of the rainforest - a flying fox. As rainforest ambassadors, they are unrivalled - friendly, intelligent and definitely with personality plus. These primates are mostly orphaned bats through tick paralysis, in areas of the Atherton Tableland to the west of Cairns. The Bat House provides environmental and tourist information on the region, as well as highlighting the research activities of the Station. Proceeds from the Bat House fund the research activities of the Cape Tribulation Tropical Research Station, feed the resident fox colony and help the yearly rescue of spectacled flying foxes. Enjoy the breathtaking Cape Tribulation scenery as you meander your way through the oldest living rainforest in the world. Cape Trib Horserides will lead you on a trail through cane paddocks and ancient rainforest, crossing streams and onto spectacular Cape Trib Beach. Cape Trib Horserides caters for beginners, intermediate and experience riders on a group of very friendly, well trained horses and is the only horse riding available in the Cape Tribulation area. Ocean Safari is a half day eco certified tour that departs Cape Tribulation twice daily, and allows for a minimum of two hours to explore the wonders of the Great Barrier Reef. Included just a short 30 minute ride away, is the opportunity to visit two spectacular reef locations. Taking a maximum of 25 passengers, this personalised tour includes all equipment and a Reef Interpretation and marine birdlife eco-appreciation presentation. The Kulki day-use area has a boardwalk which leads from the picnic area to a viewing platform on the Cape, providing breathtaking views of the coastal mountains, beach and fringing reef. It is also possible to walk from the Kulki car park to the beautiful Myall Beach (south of the Cape Tribulation headland). Toilets and picnic tables are provided.